We’re back open for the 2013-2014 surf season!!! Super stoked!! Surfing is popular among people of all ages and abilities. It promotes health and wellbeing, including cardiovascular fitness as well as strength in the core, back, shoulders and legs. Taking lessons to learn the correct surfing technique will help to get you started. You should be a strong swimmer and always be aware of the safety aspects of being in the surf. 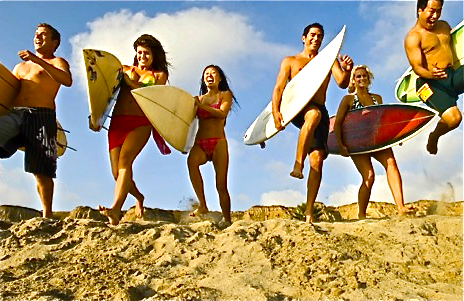 Surfing originated in Hawaii. These days people surf all over the world – wherever there is a wave. Surfers enjoy the physical benefits of paddling and surfing, being in the fresh air as well as the overall wellbeing benefits of surfing. Cardiovascular fitness – from paddling. Shoulder and back strength – these muscles will strengthen from the paddling. A good outlet for stress and tension. Surfing is not as easy as it looks. It is worth taking several lessons to give you the basics and hopefully get you up on your feet. As surfing involves the ocean, you should be a strong swimmer and always be aware of the safety aspects of being in the surf. If you are not sure about a suitable surfing spot, ask the local surfschools about info. Having the right equipment is essential to get the best out of the surf. Your board should suit your body and your ability. For example, start with a long board as they are easier to stand up on, paddle and ride. In cold water places, wear a wetsuit if necessary to keep you in the water long enough to learn. Arm paddling – this mainly involves your arms. You need to position your body towards the nose of the board, keep your feet together and paddle with your arms using a freestyle swimming action (alternating your arms). Kick paddling – this mainly involves your legs. You need to slide your body to the back of the board so your legs are free to kick. Combination arm and kick paddling – this involves using both methods, which will help you to move more quickly. If someone is already riding a wave, don’t try to paddle around them. The person closest to the breaking wave has right of way. Respect other riders’ right of way. Share the surf and don’t steal other riders’ waves. Don’t take it out on other people if you’re having a bad day. Respect other people, their gear and their belongings. This applies not only in the water but on the shore and in the car park. Always apologise and make sure that everyone is okay if you make a mistake and cause a collision. Debris floating out to sea. Enjoy surfing but at the same time be aware of rips, as they can pull a weak or tired swimmer out into deep water and into trouble. Check the beach and make sure you are not alone – take a friend. Look for any restrictions on the beach and follow them. If you are a beginner, stick to beach breaks with a sandy beach. Make sure the top of your board is waxed up or has some form of grip and check your leg rope is in good condition. Wear a leg rope tied to your surfboard if you are a beginner. Wear sunscreen; even on cloudy days. Wear what makes you comfortable, everyone has different tolerances for cold water. If you would like some protection from the cold, wear a wetsuit, steamer, booties, gloves or head gear. Watch the area before you go in to see the best place to paddle out. Watch other people to see how they are getting on out in the surf. Warm up before entering the water. 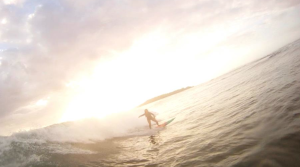 Surfing has benefits for your health and overall wellbeing. You need to take care in the water at all times. Choose the equipment and the surf spot that’s suitable for your ability and fitness. Surfers and health goeroes Gabby and Laird Hamilton show you all about being healthy and happy in a fun way. We love to follow their blog full of usefull tips and fun excersises to help you become strong in body and mind! A trucker cap or mesh cap is a type of baseball cap. It is also sometimes known as a “gimme [as in ‘give me’] cap” or a “feed cap” because this style of hat originated as a promotional give-away from feed or farming supply companies to farmers, truck drivers, or other rural workers. the back to ensure that one size fits most. The original feed caps bore company logos on the front foam section of the cap, either printed or as a patch sewn on. These companies typically had a rural clientele, such as the local feed store or John Deere tractors. 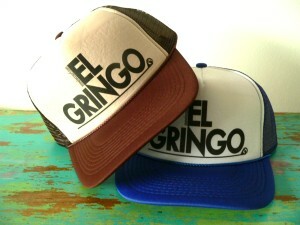 Trucker-style hats can now be found with other pictures, logos, flags, camouflage, or humorous sayings on the front. 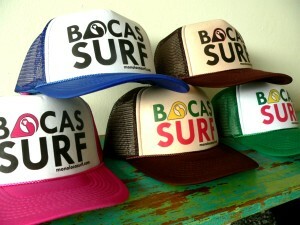 Trucker hats are still available as promotional items. In the early 2000s, the trucker hat became a mainstream fashion trend, predominantly among suburban American youth. This came about with a sense of irony due to the hat’s rural or blue collar association and typically older demographic. It has frequently been donned by celebrities; musician Pharrell Williams and actor Ashton Kutcher in particular helped make the hat fashionable. However, in a 2008 interview with Fashion Rocks magazine, singer Justin Timberlake claimed that, while Kutcher has been cited for popularizing the trucker hat, Timberlake had been wearing them since the age of seventeen. The trucker hat trend was lampooned in the King of the Hill episode “Grand Theft Arlen”, in which teenagers confuse Hank Hill by asking where he bought his Strickland Propane cap and questioning its irony. In recent times, many outlaw country, punk, metal, blues and rock musicians have worn trucker hats on stage and in photographs. Love birds live here in Bocas del Toro, Panama. They choose a mate for life, and can be seen soaring in pairs between the clouds and bright beams of light. They fly free, sharing the joy of gliding along through paradise. I feel a connection to them as I soar, flying free down the face of a wave. In these pure moments nothing matters as I glide over the surface of the sea and return to smiles and laughter of friends.My first day in Bocas began with an early morning surf at La Punta off of the tropical, jungle island Carenero where I lined up with a waterfall to catch the left. After surfing with Joan and Juan David, I joined Juan David to train to teach surf lessons at the Mono Loco surf school.In Cocoa Beach, I work for the Ron Jon surf school and have also instructed at Chicabrava, which is an all-girls surf camp in Nicaragua. At both schools, we use the same technique that involves taking clients to the beach and pushing them into waves. The student focuses on popping up and riding the wave. Learning to paddle usually does not occur unless the student learns to pop-up early in the lesson. 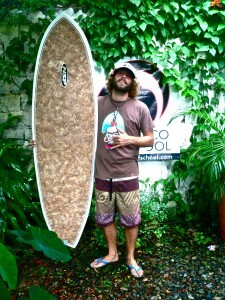 I quickly learned here at the Mono Loco surf school, learning to surf is taken to another level. First, the students are taught theory which includes ocean safety, the international rules of surfing, board safety, and popping-up on the board. Next, we take the students with their boards to a boat. Then, we take the boat to a reef break called Black Rock. At Black Rock, we situate the students into a channel where they wait as they take turns entering the line-up with an instructor. One at a time, Juan David guided each student into wave, coached them on paddling, and rode the same wave next to the student. During my training, I could not stop smiling. Instructing in this way is exciting and allows the instructor to see exactly what the student is doing while attempting to pop-up and ride the wave. It also allows the instructor and student to fully share the joy and energy of the same wave. Together they sail in a pair; free over the sea. My new life in Bocas began less than a week ago and already the Caribbean has supplied the adventure I crave and its’ natural beauty captured my heart. 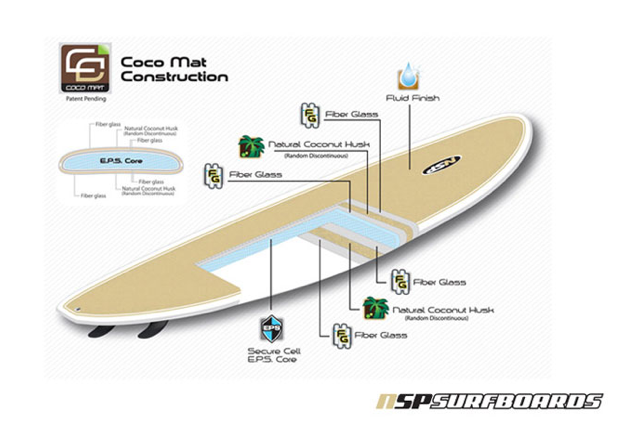 The NSP Coco Mat technology is the world’s first and only Patent Pending surfboard constructionbuilt using all natural coconuthusk fibers. By integrating the random discontinuous Coconut fibers to the lamination and through our exclusive construction method, we deliver one of the most amazing surfboards you will ever ride. The most impressive characteristic of the coconut husk fiber is its incredible strength to weight ratio. After hundreds of surfing hours and further verified in laboratory tests, we have proven that Coco Mat is the lightest and strongest surfboard on the market today. The natural fibers of the coconut are readily available, need minimal processing and come from local self sustaining crops near our manufacturing facility. The Coco Mat boards have a responsive, fluid ride with great flex characteristics and look organically beautiful with the visible, randomly oriented natural fibers. NSP is proud to bring you our new Coco Mat boards which are the lightest, strongest and most natural looking surfboards and SUP’s on the market today. 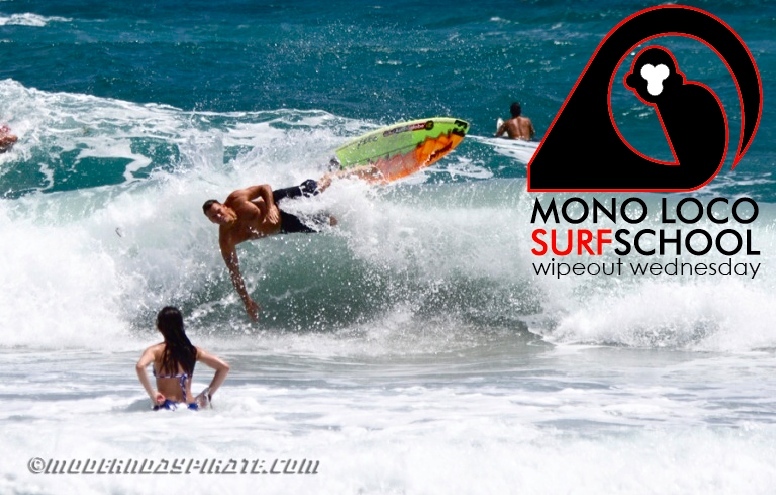 Mono Loco Surf School in collaboration withXookazine started to keep track of the funniest, craziest and most famous wipe-outs. Sometimes it’s one of our students, teachers or friends and other times it’s your favorite pro surfer or a complete stranger.Every wipe-out brings you closer to perfection and makes you a better surfer. Remember…when you’re coming up to the surface, take a deep fresh breath and SMILE! All boards have 1 thing in common; they need a layer of surf wax to prevent you from slipping away. Make sure you apply enought before paddling out. Choose the right wax according to the waters you’re surfing (tropical/warm/cold). Please buy ecological wax if possible. This will keep our oceans clean and all fish happy. Many different things cause getting distracted. It can be the surfers around you, a crazy current, an unsudden big set of waves or a hot surfer on the beach. The best advice is; keep your eyes on what’s happening around you and the waves. Position yourself in the right spot and stay focused. Before you get wet, pay close attention to where your ideal waves are beginning to break in relation to the shore. It’s important to not only pick a spot on the beach to line up with, but also to have an idea of how far out you need to be from that point. Paddle out beyond the break and to one side and observe where more experienced surfers are lining up. Also pay attention to the waves they’re choosing. This will give you another perspective from what you saw while on the beach. Other surfers will give you a good reference point when determining where you need to be. Focus on the aproching waves and the surfers around you. This way you’re prepared on what’s coming. Always apply international surfing rules and act acording to your level. Respect other surfers. A true surf classic, the nosedive. Water travels up your nose and your board shoots from under your body to the back. To prevent this from happening please practice the following according to your level. Shift your body to the back of the board (beginner) When you are already paddling for the wave and feel that you might go nose first… shift all of your weight to the back of the board. Push the board out in front of you with the majority of your body on the back of the board. This will prevent the board from aiming straight down into the water. If you’ve managed to still get the wave, pull yourself back to the front and pop-up. Turn your board (intermediate) If you would like to catch wave that has a peak, then start paddling for the wave with your board turned away from the peak at a 45 degree angle from the beach (instead of paddling straight forward). You will have to paddle stronger since you will have more friction from paddling at an angle. When you catch the wave, pop up and enjoy a ride across the face of the wave. All (upcoming) surfers who book a 5-day course at the Mono Loco Surf School will receive an official Mono Loco Surf Certificate. 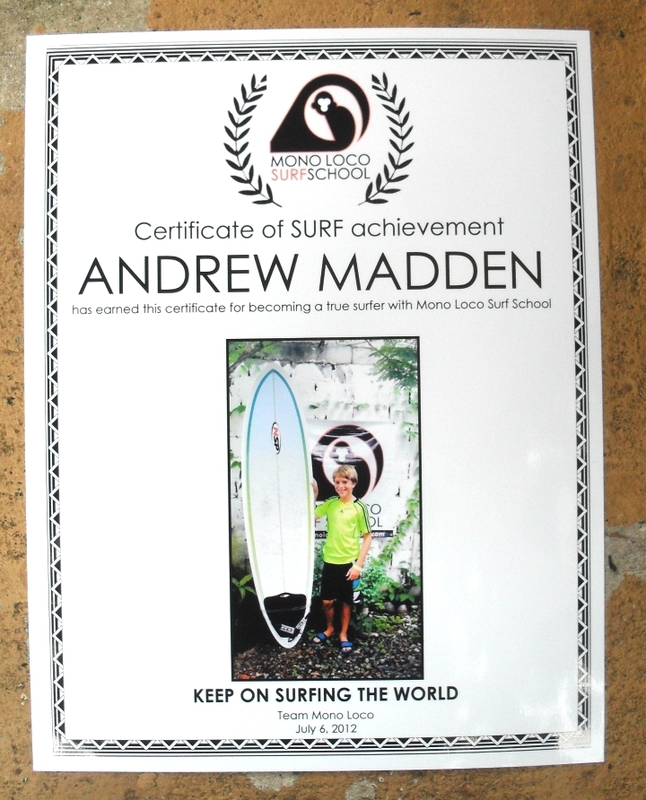 Little surfers (kids) will receive one after taking a 3-day course. Mono Loco also provides gift vouchers. The perfect present for a friend, partner in life or family. 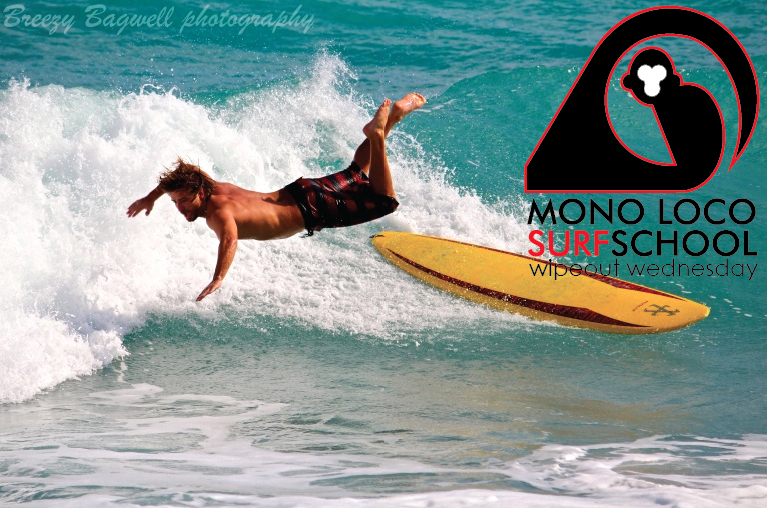 Come down to the Mono Loco Surf School for more info and reservations. 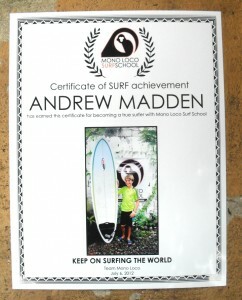 Keep ons surfing the world! © 2012-2017 Mono Loco Surf School by Creative Marketing Design. All Rights Reserved.